In this, the third installment of the Commissario Guido Brunetti series, Brunetti finds himself investigating an unusual death. While I have read the first two books in the series, Death at La Fenice and Death in a Strange Country, it was last month when my reviewing at low ebb. These books are quite popular at the library, so I had to return them before reviewing them. While solid, enjoyable mysteries (first brought to my attention by FictionFan, of course), they were nothing so brilliant that I felt the urge to re-check out the books just to review them. Set in Venice, the series follows a policeman by the name of Guido Brunetti. Brunetti is a delightfully normal man. He has a wife and two children, all of whom he loves and who love him. He enjoys his job, but has an irritating supervisor. Some of this coworkers are intelligent and helpful, while others are lazy and annoying. Brunetti is intelligent, but not a genius. He does not spend his spare time getting drunk, and he does not think that he is a god among men and thus above the law. Despite all this (ha ha), these books are a pleasure to read. Leon leads the reader through the story at a comfortable pace. While these books have yet to keep me up at night, I definitely am engaged while reading them. The author does an excellent job of providing the reader with some grey situations, leaving food for thought even after the book is finished. My only personal problem with these books is my own lacking – I don’t really know much about Italian culture, government, or law enforcement. Overall, though, I have still been able to understand and enjoy the books. Dressed for Death seemed like the type of story that should irritate me, focusing on the death of a transvestite whore, yet somehow Leon manages to avoid making the entire story a political issue. Instead, she prevents us with gay people who are kind, hardworking, and overall positive characters, and also gay people who are liars, sneaks, and overall negative characters. She does the same with straight people – in short, she writes very realistically, reminder her readers that “good” and “bad” people are not defined by any single aspect of their lifestyle. I don’t have a good place to insert this quote into this review, but it just really stuck with me, so I will finish with it. I think that it illustrates the way that Leon manages to advocate a sensible, balanced approach to many of the issues that arise in her books. With 24 books (and counting), this is another series I will be reading through for quite a while, so stay tuned for further reviews! 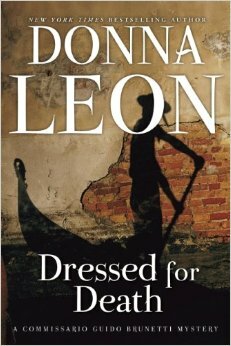 This entry was posted in Book Review, Fiction, Mystery and tagged Donna Leon, Dressed for Death, mystery. Bookmark the permalink.